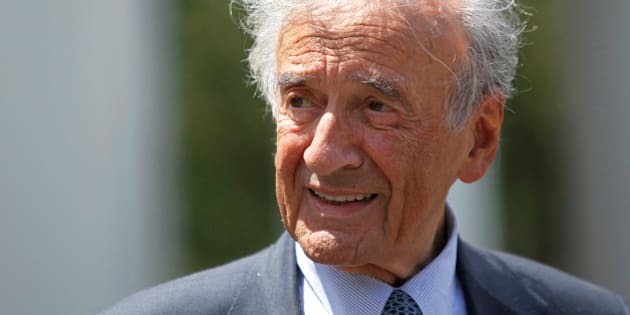 At this critical time in history, it is more important than ever for us to pause and remember the courageous Elie Wiesel, tireless defender of peace and advocate for the persecuted, repressed and disenfranchised. Wiesel, age 87, died this weekend at his home in New York City. At this critical time in history, it is more important than ever for us to pause and remember the courageous Elie Wiesel, tireless defender of peace and advocate for the persecuted, repressed and disenfranchised. Wiesel, age 87, died this weekend at his home in New York City. We will mourn his death. And we will miss his sage counsel which exhorted us to "Think higher and feel deeper." Born in Romania, the teenager Wiesel survived the death camps of both Buchenwald and Auschwitz. He lost his mother, father and younger sister to the Holocaust. The orphaned Wiesel emerged as a witness to the horrors and inhumanity of the Holocaust. Never shall I forget that night, the first night in camp that turned my life into one long night seven times sealed. After the war, Wiesel worked as a journalist but for many years, he steadfastly refused to write of his Holocaust experiences. French author, Nobel Laureate in Literature, French Résistance fighter and later good friend, François Mauriac, encouraged the reluctant Wiesel to write about his experiences. Mauriac likened Wiesel to Lazarus, reborn from the dead. Wiesel came to write 57 books, including the trilogy Night, Dawn and Day. Wiesel became the eyes of the Holocaust. He made the horrors real. He would never let us forget that such savagery and debasement were possible and resulted in the deaths of roughly six million Jews. Wiesel felt duty-bound by his survival for us to remember. And in that remembering, we honour those who died, we add to the collective consciousness, and, hopefully, we shape the future by the lessons of the past. In 1986, Elie Wiesel was awarded the Nobel Peace Prize and the Nobel Committee described him as a "messenger to mankind." Wiesel was a truth-teller. He was unafraid to speak of the unspeakable. He was willing to shed light on the darkest of times. He was an activist and advocate. He was a voice of compassion amidst the madness. We need Wiesel's wisdom more than ever now. Our world has seemingly gone mad. We have lost our center, or, more applicably, our heart. Fear and terror have run amok. Racism, torture and countless acts of cruelty and violence have become all too commonplace. Our planet is devolving into one giant hotspot of misery. May we heed the words of Wiesel: "Indifference, to me, is the epitome of evil." Let us stand together for one another, knowing that a crime against one of us is a crime against all of us. Let us speak up and speak out where there is racism, prejudice and bigotry. All hearts beat as one.